subaru impreza wrx sti gdb - J's Garage Export Co., Ltd.
2000.12 : Subaru announced the release of the new-age GDB Impreza WRX STi (type A). The Subaru Impreza WRX STi series has been developed to contest in the World Rally Championship (WRC). The Impreza WRX STi series features improved driving performance while maintaining its ease of daily use by featuring a newly developed highly rigid 6 speed manual transmission, a new designed EJ20 Horizontally-Opposed 2.0liter AVCS turbocharged engine, a large intercooler, and strut suspension with inverted type dampers. The EJ20 Horizontally-Opposed 2.0liter AVCS turbocharged engine makes 280 horsepower at 6400rpm and 38.0kg-m of torque. To increase the engine reliability, the semi-closed deck type cylinder block is adopted. The engine performance has been improved by adopting the lightweight shimless valve lifters and AVCS (variable valve timing system), by improving the turbocharger, by improving the cooling capability, and by adopting the enlarged intercooler and air-intake. The Impreza WRX STi uses the all wheel system with center diff, Viscous LSD, and Suretrac LSD. The Impreza WRX type RA (16in) is equipped the driver's control center differential switch (DCCD), and adopts a mechanical rear LSD and a Suretrac front LSD. The suspension has been updated to improve stability and control geometry changes in hard cornering. And the Impreza WRX STi adopts Brembo brake system, Supersports ABS with G sensor and EBD, and inverted type dampers. 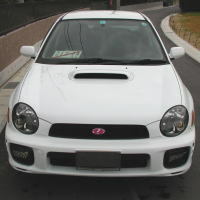 2001.09 : The Impreza WRX STi got a mild face-lift (type B). And The Impreza WRX STi "Prodrive Style"was added to the Impreza WRX STi line-up. It comes with exclusive front bumper & front grill, and side & rear spoiler that designed by Prodrive. 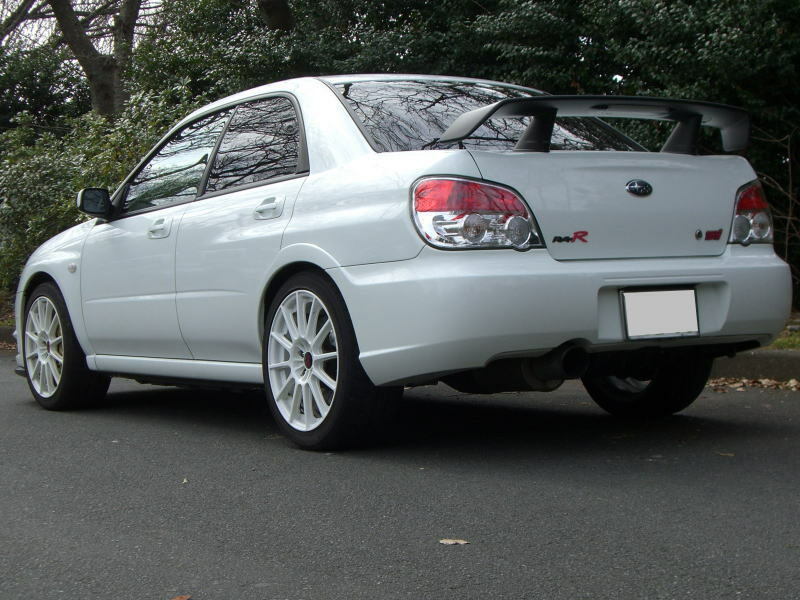 2001.12 : The Impreza WRX STi type RA Spec C was added. And it achieves the max torque of 39.2kg by improving the turbocharger and cylinder exhaust efficiency. Compared to the Impreza WRX STi type RA, Impreza WRX STi spec C is about 90kg lighter through the adaptation of lighter glass, and thinner roof construction and a trunk lid. A rear crossbar has been fitted to further improve body rigidity. The turbocharger in the Impreza WRX STi spec C uses precise ball bearings in the shaft to reduce friction, thereby offering a smooth and speedy turbo boost and providing ideal engine response. Large water reservoir for the intercooler water spray as well as an air-cooled engine oil cooler have been implemented to ensure stable engine performance. 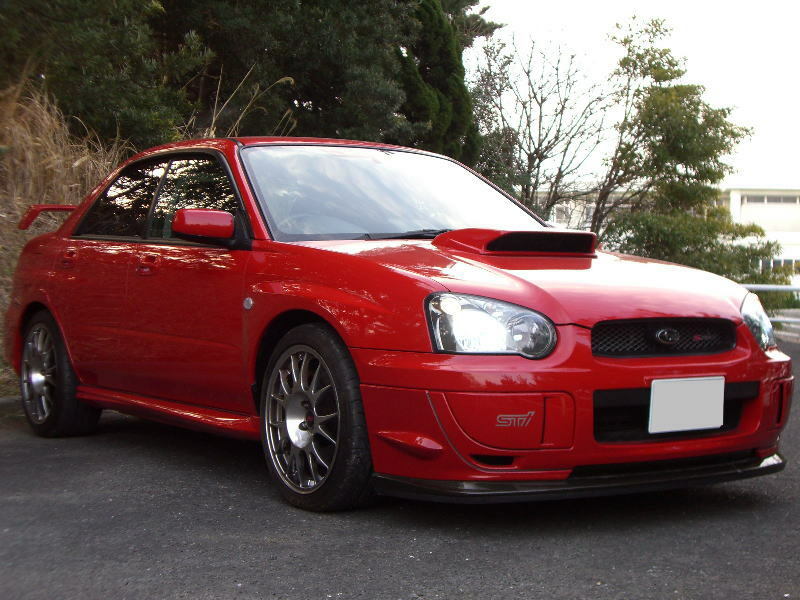 2002.06 : The Impreza S202 STi version (400 limited production) and the Impreza WRX STi limited were introduced. The S202 STi version, based on the WRX STi Spec C 17-in model, is powered by the tuned EJ20 engine that makes 320 horsepower. The Impreza S202 STi versions is equipped with a higher power ECU, a air-intake for competition, an air duct hose, a engine oil cooler, a titanium muffler, rotors with slit, sten-mesh hoses, PIRELLI P-ZERO tires, RAYS wheels, a STi carbon rear spoiler, a exclusive gauge cluster, power window, center door lock, and manual air conditioner. The Impreza WRX STi limited, based on the Impreza WRX STi, features the Spec C engine (but not ball bearing turbo) that makes 39.2 kg of torque. 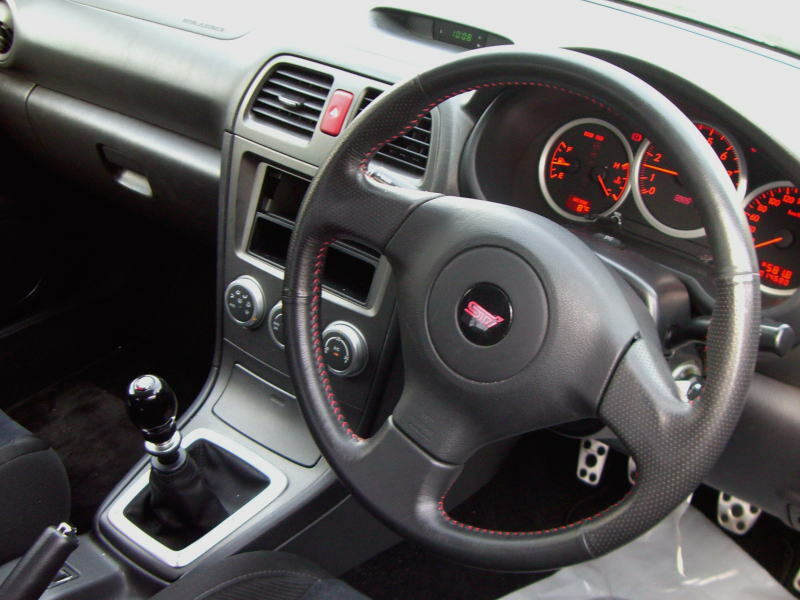 2002.11 : The Impreza WRX STi (type C) got major upgrades including new front exterior design and feeling of quality improvement of interior design. The engine makes even more power, it makes torque of 40.2kg-m. Intercooler efficiency has been boosted with enlargement of the intercooler air intake. And the Impreza WRX STI adopts the twin scroll turbo, equal-length 4-2 exhaust manifold, and aluminum pistons. Furthermore, the engine reliability have been enhanced by improving the durability of a cylinder block, connecting rod, and crank shaft. 2003.04 : The Impreza WRX STi Spec C Limited was introduced. The Spec C limited is equipped with power window, center door locks, electric powered door mirrors, manual air conditioner, exclusive seats cloth, off black center panel & venti rater grille, black door trim, leather wrapped shift brake lever & plating button, red meter, REV indicator, and sports pedals with aluminum pads. 2003.12 : 2003 V-Limited was introduced. 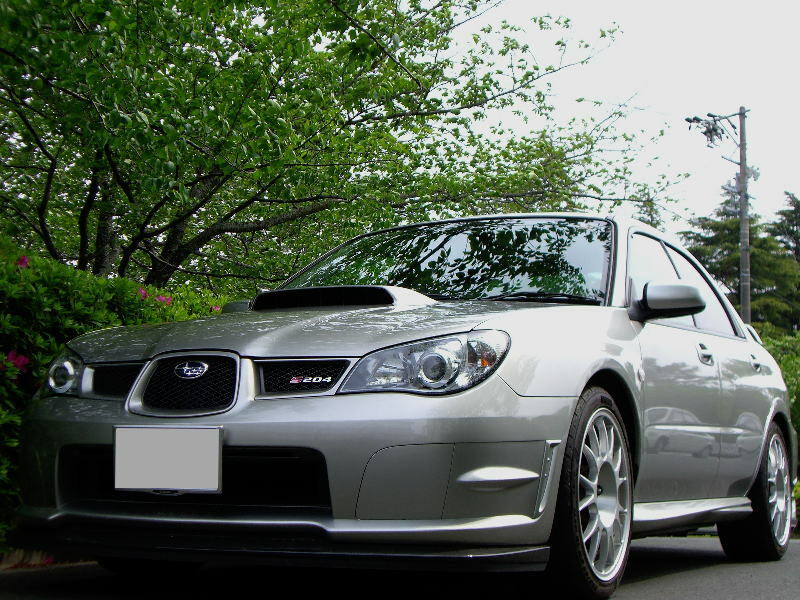 The WRX STi 2003 V-limited is equipped with exclusive suspension(tuned by Arai), STI front under-skirt, STi aluminum shift knob, roof ventilator, and SWRT stickers. 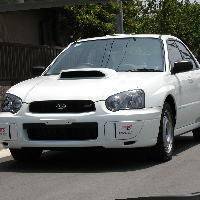 2004.07 : The limited edition Impreza WR-Limited 2004 was added to the Impreza WRX and the WRX STi Spec C. The WRX WR-Limited features, based on the WRX, including front corner spoilers, the STi front under skirt, a large size rear spoiler, RAYS 17 inches alloy wheel, HID low beam headlights, exclusive front bucket seats in blue color, sports pedals with aluminum pads, exclusive shift knob, and exclusive stickers. WRX STI Spec C WR-Limited is equipped with the full auto air conditioner, exclusive bucket seats, sports pedals with aluminum pads, center door lock, power windows, and electric fold-in colored door mirrors. 2004.10 : The Impreza WRX STi Spec C type RA is added to the Impreza WRX STI line-up. The WRX Spec C type RA features including front corner spoilers, the STi front under skirt, 17x8.0 STi alloy wheel wheels, STI sports suspension, full auto air conditioner, center door locks, power window, and sports pedals with aluminum pads. 2004. 12 : The Impreza S203 was introduced. The turned EJ20 engine adopts the large sized boll bearing turbo, exclusive ECU, adjusted pistons and con-rods of the balance, sports catalyzer, and the engine oil cooler. 2004.12 : The Impreza WRX 2004 V-limited features including the STi front under skirt and STi side skirt, a large size rear spoiler, RAYS 17in alloy wheels, HID low beams, exclusive bucket seats with SWRT stitching, and SWRT stickers. 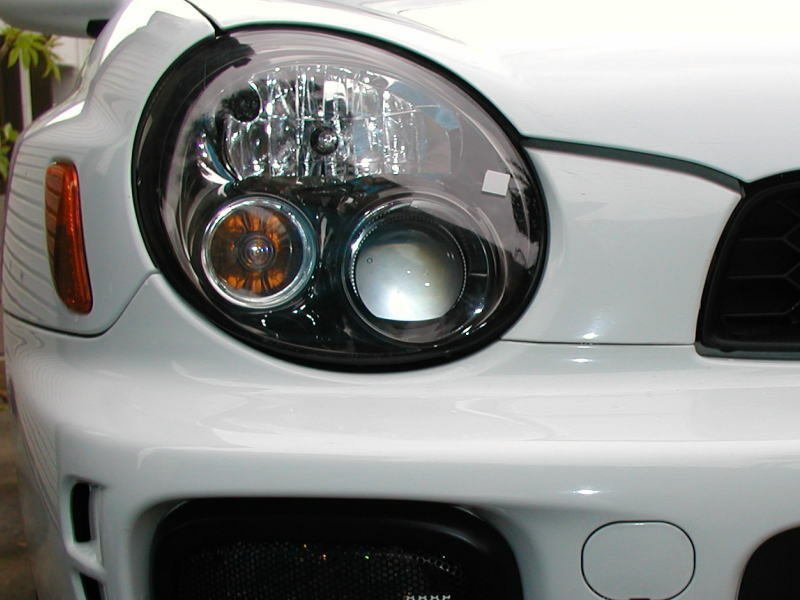 2005.06 : The Impreza WRX STi (type F) got major upgrades including a newly designed front bumper, grille, headlights, and rear combination lamps. The exclusive 2.0liter BOXER engine has been improved,and it makes a maximum engine torque of 422Nm (43.0kg/m). 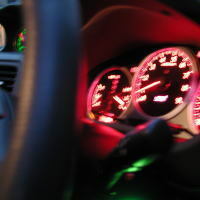 The 6 speed manual transmission employs carbon-synchronized gears for 4~6 speed. And its electronically controlled AWD system DCCD has been improved by adding the torque-sensitive mechanical LSD. The Impreza WRX STi adopts the front corner spoiler, side grille, a 260km/h speed meter, a roof vane (spoiler), and under diffusers. The Impreza Spec C adopts a large sized rear spoiler, black color interior design, a 260km/h speed meter, immobilizer, aluminum sports pedals, full auto air conditioner (17in version), roof ,and under diffusers. 2005. 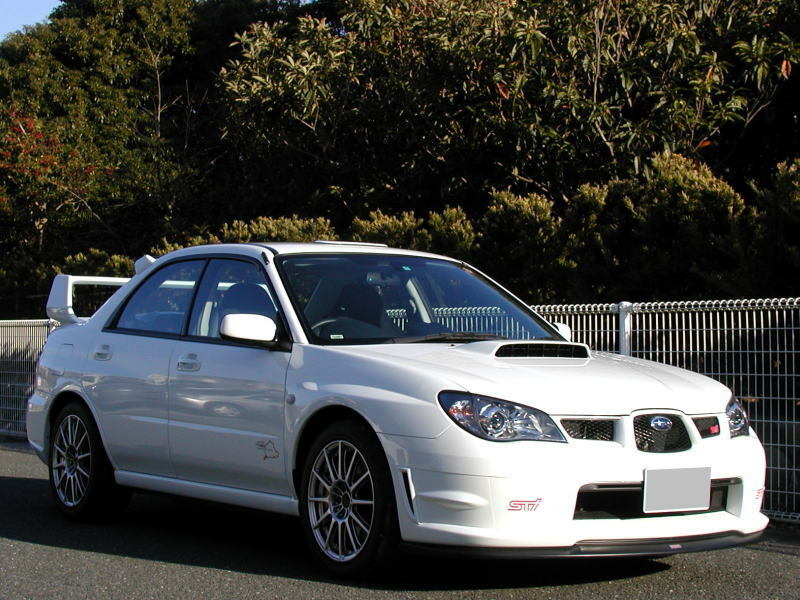 08 : The Impreza WRX STi spec C type RA 2005 (350 units) was introduced. The Impreza WRX Spec C type RA 2005 features including STi front under skirt, 17 inches alloy wheels, a stainless muffler, and exclusive sports suspension. 2005. 12 : The Impreza S204 was introduced (600 units) The EJ20 engine has been improved by having the exclusive large sized boll bearing twin scroll turbo, the exclusive ECU, the exclusive sports catalyzer, and the titanium muffler. Moreover, the EJ20 engine has achieved a smooth engine rotation rise by the weight equalization of pistons and con-rods, and by the balanced crankshaft by the hand-work. And it equipped with performance dampers jointly developed by YAMAHA and STi, and exclusive strut, BBS 18in x 8.5 alloy wheels, outer ventilated type brake rotors, Recaro seats, and the rear wing. 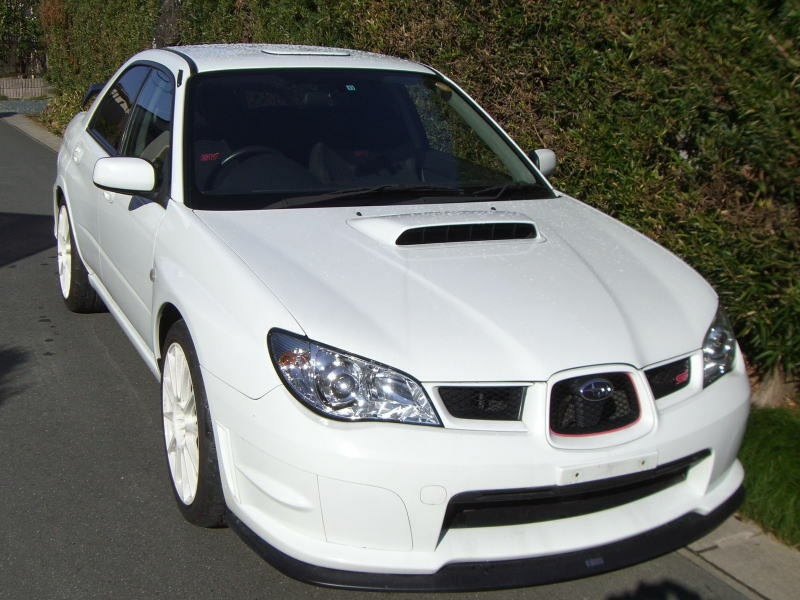 2005.12 : The Impreza WRX STi Spec C V-limited 2005, based on the WRX STi Spec C 17in version, features 17 inches white color alloy wheels, a jyurakon STi shift knob, front bucket seats, a STi front under skirt, and a aluminum shift boot ring. 2006.11 : Subaru announced the release of the Impreza WRX STi Spec C type RA-R, based on the Impreza WRX STI Spec C, in Japan on November 8. The Impreza WRX STi Spec C type RA-R comes equipped with a specially tuned EJ20 engine matched to a 6 speed manual transmission. The EJ20 engine makes 320 horsepower (235kw/6400rpm, 432Nm/4400rpm) by having large size tuned turbines, exclusive ECU, a exclusive catalizer and a stainless muffler. The Impreza STi Spec C type RA-R has adopted Brembo 6 pods front brake calipers,exclusive grooved rotors, exclusive stabilizers and exclusive suspension to achieve the high driving performance. Furthermore, the Impreza WRX STi Spec C type RA-R is equipped with exclusive 18x8.5 alloy wheels, Potenza RE070 235/40R18 tires,a red hazard switch, a dark metallic center console, a front under skirt, a exclusive design front grille center, and a RA-R emblem.